Having stayed up far too late it took me a while to get going the next morning. After a slow start to the day I tidied and cleaned the house a bit, went for another run at Kilchoman Beach in Machir Bay and finally was ready to get out in the afternoon. 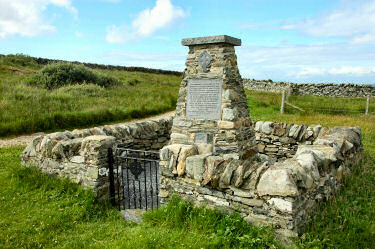 I decided to drive out to Sanaigmore to go hillwalking there. 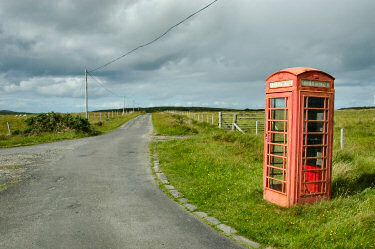 On the way I stopped near Carnduncan to take a few pictures of the lonesome old style red phone box and the view over Loch Gorm towards Machir Bay. In Sanaigmore I parked in the new car parking area next to the Exmouth memorial (one of two on Islay, there is another Exmouth memorial at Tràigh Bhàn). 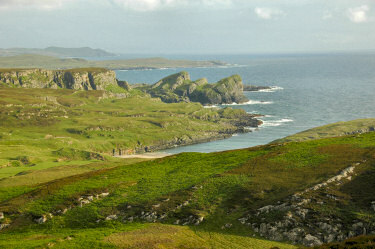 Soon I was ready for my walk, having decided to walk to the cliffs and hills to the west of Sanaigmore, above Gleann Tuath. 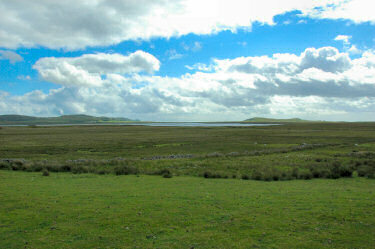 The first stage of the walk took me across the grassy dunes just to the west of Sanaigmore Bay. Carefully avoiding the cattle I made my way to the shore and kept following the shore towards Port Ghille Greamhair. There were also quite a few sheep around, seemingly carefully watching my every move. Not that there was any risk of me getting anywhere near them, considering the quite rough ground. 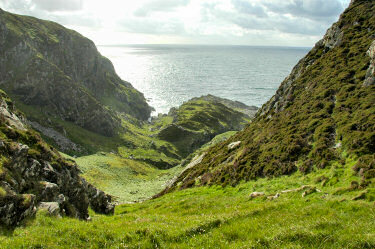 Once I arrived at Port Ghille Greamhair I left the shore and climbed up the hills leading out to the cliffs. My hopes for some excellent views weren't disappointed. Among others the view over Ton Mhòr (66m) with its steep cliffs was impressive. Behind it Sanaigmore Bay, Ardnave and the north of Islay was also visible. While I was the only human out there (at least I didn't see anyone else) I was far from alone. A Buzzard was hunting around the cliffs (unfortunately the pictures didn't turn out very well), various other birds could be spotted as well. 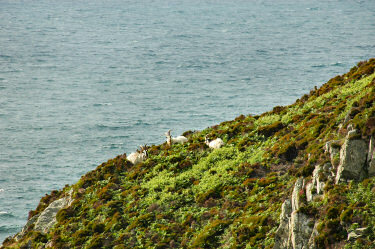 But the most interesting ones were at least initially quite elusive: The goats. Rumour has it they escaped from the Spanish Armada all those years ago. There are some on The Oa, a few on the Rinns and some more in this area. At first I only saw them quickly disappearing behind the hills, not really getting any opportunity to take any good pictures. But I was going to get my chances later. 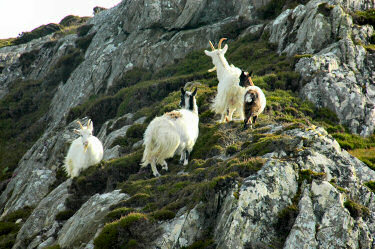 Making my way along the coast I saw them again on cliffs high above the sea, almost inaccessible for humans, but not too difficult for the goats. 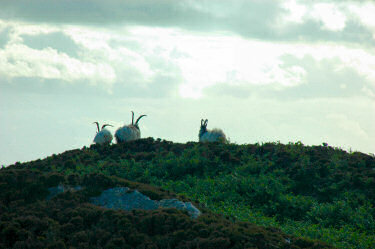 Finally I managed to get a much closer view of the goats. Across a cut in the hills they felt comparably safe and allowed me to take a few pictures before they ran away again. Not many humans come to this area, so may be they are not used them. Over quite rough ground my walk continued, I had decided to aim for the trig point at Cnoc Uamh nam Fear as my destination. At 128m it is the highest point in the area and I was hoping for some good views. Using the trig point as an improvised tripod I took the (kind of) obligatory self portrait, that's me on the left near the summit of Cnoc Uamh nam Fear. 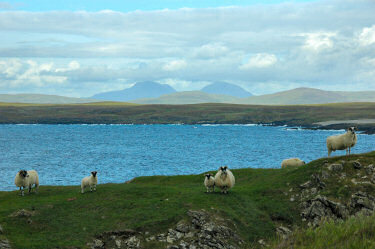 Sanaigmore Bay and the Paps of Jura provide the background. I spent a bit of time looking around on the plateau, the views south and north-east were the most interesting ones. For a view down the cliffs I would have to walk further west, which I decided not to do this time. 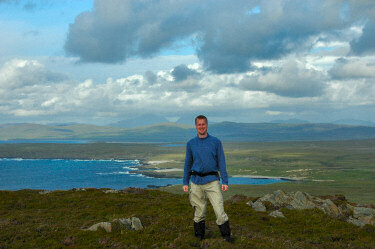 I quite liked the view over Tràigh Bhàn and Dun Bheolain, looking south. They looked quite dramatic, lit up by the low evening sun. In the distance I could see Kilchoman, where I would return to later in the evening. The return leg took me mostly along a quad bike track once I had descended from the hill. I took a short detour to Port Ghille Greamhair, which looked quite nice in the evening. Still more of a place for earlier in the day. The hills and cliffs to the west were blocking most of the sun by now. Back at the car park in Sanaigmore I changed and drove back to Kilchoman for a late dinner. 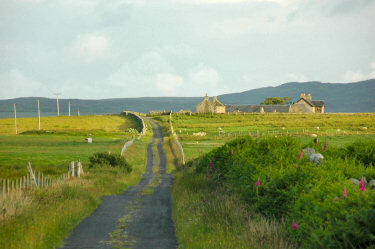 The drive back along the single track road was quite nice with the mild light over the fields and farm buildings. A nice end to a nice walking afternoon. If you are interested in more information about Islay, Colonsay and Jura you might also be interested in my Isle of Islay pages. 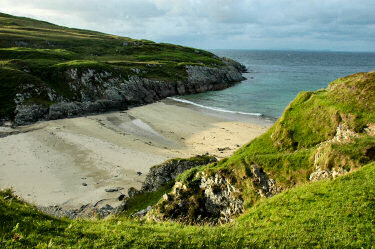 There you will find many more pictures and further information about Islay, Jura and Colonsay.